Today's Chilly Fish is inspired by the classic Indo-Chinese recipe; is excellent for entree' and can also be served as a side dish with fried rice. 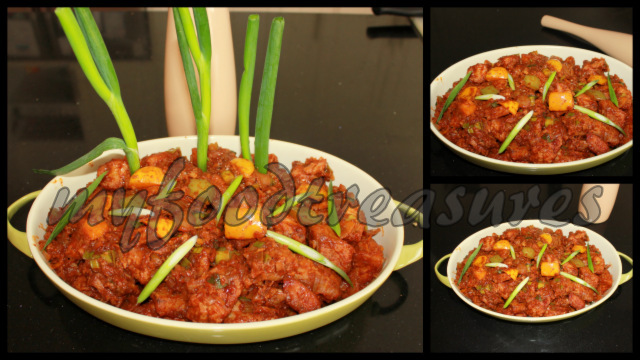 It is very similar to the Indo-Chinese chilly chicken and is a seafood lovers dream food. It is best prepared with any firm white fish fillets like Snapper or Barramundi; but be sure that the fish is fresh. 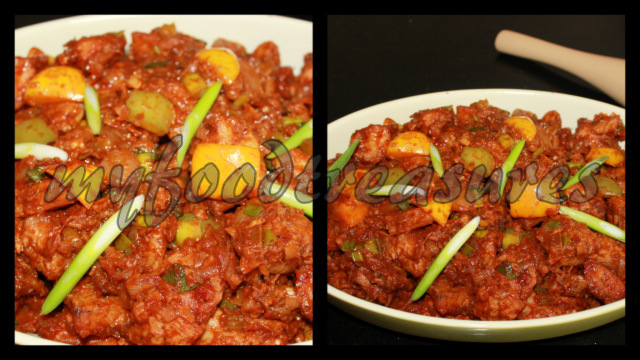 I personally feel that seafood recipes are totally lost when you prepare it with the frozen varieties. I prepared this a few weeks back when some of my friends came home for lunch. And I learnt something on that day. Maintaining a blog and cooking for friends cannot go hand in hand. Well! At least for me that is true. The issue here is more than often you take double the time preparing your dishes because you are cooking and trying to write down the recipe at the same time and then also left with very little time to take some good clicks. So you end up compromising yourself with not so satisfactory clicks - which is so very evident in my snaps here. So I've decided to distance the two; I either cook for my blog or I cook for my friends - but never together at the same time. Hopefully, I will find the time for both. 1. Marinate fish with dry marinade, cover and refrigerate for two hours. Mix all ingredients for wet marinade and make a thick marinade to coat fish well. Add few more teaspoons of water if the batter is too thick. Deep fry fish until cooked. 2. Heat 2 tbsp oil in a wok over medium-high heat. Add garlic and green chilly and toss till it turns colour into light brown. Add chopped onion and celery and stir for 2 -3 minutes until onion softens. Now add paprika and pepper powder and stir for 1 minute. Add diced onion and toss for a few minutes until it softens. Then add all the sauces and chinese five spice together and mix well. Finally add fried fish pieces and capsicum and keep tossing for a few minutes. If the sauce gets too dry add a few tablespoons of water. This will allow the sauces to mix well through fish pieces. Remove from fire and toss in chopped spring onions. This is a dry preparation and can be served as an entree'. To serve as a side-dish for fried rice add half a cup of water, bring to boil and add 1 tbsp corn flour mixed with 4 tbsp of water and mix well. This will give you a little extra gravy. wow ..yummy dish..my all time fav! Tofu or vegetables works very well for me with this marinade. Julie - Thanks for your response darling.